Passenger cabins on the Wilderness Adventurer serve their purpose well – mainly a place to sleep, wash up, and store your things. They aren’t big, but they also aren’t intended to be where passengers spend their cruise. The expedition vessel mainly travels at night and during the day anchors or docks somewhere while the passengers hike, kayak, or explore. During the times passengers spend on board in the daytime activities like meals, cocktail hour, or presentations of one sort or another occupy some time and there’s plenty of places to sit in the public areas of the ship if it does happen to travel during the day. It also has a hot tub on the top deck. Wilderness Discoverer has three cabin options, all of which have windows with views to the outside. The Navigator cabins on the main deck cost the least and have about 77 square feet of space. Trailblazer and Pathfinder cabins on the observation deck have about 90 square feet each. The main difference between the two is inside entry on the Trailblazer cabins and outside entry on the Pathfinder. The rooms have a lot of storage space. The beds have quite a bit of open space underneath for luggage. Each room has a large set of wooden shelves for storage and a cabinet next to the bed. Rooms with inside entry also have handy coat hooks and space for boots in the hallway just outside the cabin door. All rooms come equipped with binoculars and aluminum water bottles for the passenger’s use during their adventures throughout the cruise. They also have water glasses and a hair dryer. Pathfinder room with outside entry. This one has a window seat. The outside entry rooms just got remodeled this year with all-new wood and carpeting. Bathrooms are very utilitarian, sometimes called the shoilet. Sinks sit outside the bathroom door. Inside has just space for the toilet with the area in front of it doubling as the shower. The sink has a soap dispenser on the countertop and the shower has shampoo and bath gel in a dispenser hanging on the wall. Each room has a flatscreen TV hanging over the bed. One channel displays the menus and activities of the day, one has GPS mapping so you can see where the ship is, and one plays daily wildlife movies. There’s also a bowcam channel to show what is under the sea, but the bowcam wasn’t working on our trip. One of the crew said it had met an iceberg and gotten knocked out of place to where it just shows the inside of its housing, but was slated for repair after our cruise. This entry was posted in Shipboard Life, Un-Cruise Adventures, Wilderness Adventurer and tagged Accomodations, adventure cruise, cruise ship cabins, photos, travel, Un-Cruise Adventures, Wilderness Adventurer. Bookmark the permalink. The big ships go port to port and out in open water, but this smaller adventure ship goes cove to cove exploring nature and stays closer to shore so it’s not out in as rough of water. Hey! No towel animals on the beds! Funny you mention that. I made a new towel animal each day and left it for the cabin steward. Very fun, and a variety of cruises to choose from. 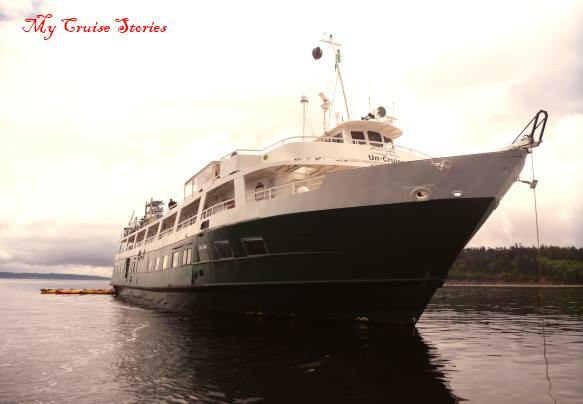 Un-Cruise Adventures has yacht cruises and a paddle wheeler as well as the expedition vessels. This particular ship has Alaska and Washington State cruises. 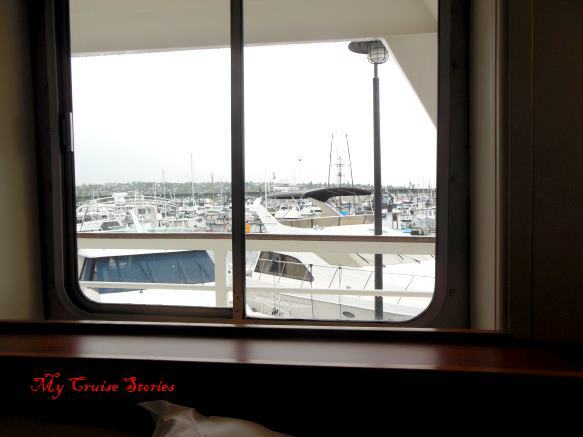 Bigger and nicer then a lot of rooms I have stayed in offshore. I would like to take a trip on there. You would have loved the beer cruise.